For this application, the customer needed to print and apply front and side labels to pallets that were from different production lines. 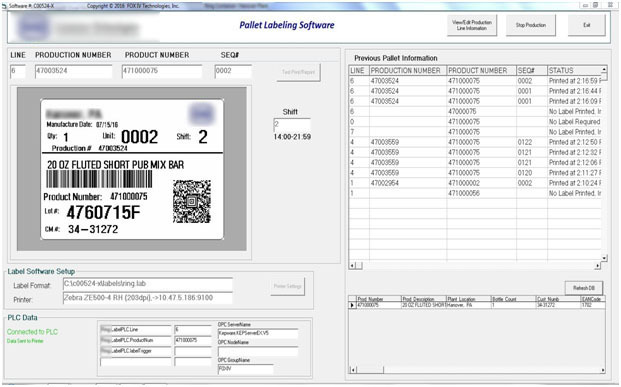 The customer’s PLC communicates to the FOX IV PC application through a Kepware server interface to get the information on the pallet to be labeled – the product number and production line that the pallet came from. The FOX IV software then accesses the customer’s SQL database to get the order and product information. This information is merged with Codesoft label design software, which runs in the background, and is sent to the label printer applicator. The customer can create new label formats or modify existing formats with this system.